The University of Baltimore School of Law provides a rigorously practical education, combining doctrinal coursework, intensive writing instruction, nationally renowned clinics and community-based learning to ensure that its graduates are exceptionally well prepared to practice law. UB School of Law faculty, staff and administration are honored to contribute to the transformative experience of an education in the law. 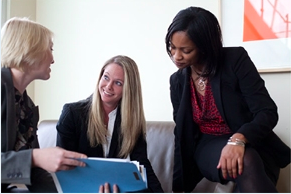 At the University of Baltimore School of Law, you will learn doctrine, perspective and skills through traditional study as well as through clinical and lawyering courses. Your legal education is enriched by work on journals and membership in student organizations and government, as well as by participation in centers focused on local, national and global issues.As a graduate of the school, you will enter the legal profession exceptionally well prepared to analyze clients' legal issues, make oral and written presentations to courts and administrative bodies, and advocate for positive change on a host of issues. School of Law alumni serve in prominent public positions, many as lawyers and judges, changing their own lives and those of others through the profession of law. The University of Baltimore School of Law offers a number of post-J.D. programs designed to complement your legal education, and prepare you for a legal-skills marketplace that is increasingly focused on specialization and a deeper skillset. The School of Law's LL.M. LOTUS program provides an ideal opportunity for foreign-trained lawyers to study U.S. law at a leading center for international and comparative law. Discover more. The School of Law's LL.M. Tax program affords working attorneys with an opportunity to strengthen their knowledge of tax and enhance their capabilities in a number of tax specializations. Find out more. Students and alumni reflect on their School of Law experience.